New York, NY—J. Walter Thompson, the agency of record for De Beers’ advertising including Forevermark, will be folded into owner WPP’s digital ad network Wunderman, Adweek reports. The news was announced to employees Monday morning. The new organization will be known as Wunderman Thompson and will be headquartered at JWT’s Lexington Avenue offices in New York. Forevermark executives had no comment on the change, a company spokesperson told The Centurion. The advertising industry has been undergoing major consolidations in recent years. WPP, a UK-based advertising conglomerate, already owns JWT, along with other legendary brands such as Ogilvy & Mather and Young & Rubicam. It recently also folded Y&R into its digital brand VML. Although Wunderman executives deny the JWT change is in effect a takeover of its operations, JWT has been struggling, say reports in the advertising industry. De Beers’ legendary tagline “A Diamond Is Forever,” still ranked as the number-one advertising slogan of all time, was created by N.W. Ayer, the Philadelphia-based ad agency that was at one time the oldest advertising agency in the world. N.W. Ayer lost the De Beers account to J. Walter Thompson in 1995; employees of the Diamond Promotion Service and Diamond Information Center, both part of the De Beers account, went to JWT. 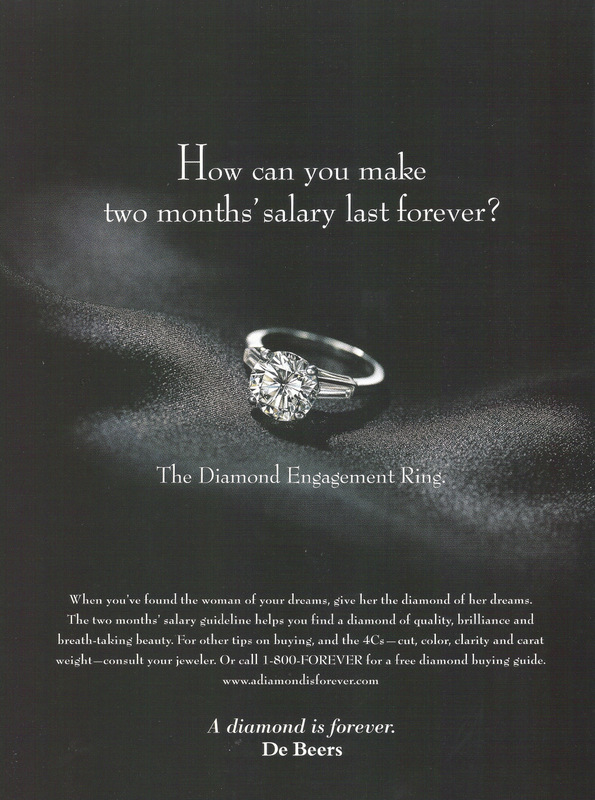 De Beers' advertising launched both the greatest brand slogan of all time, "A Diamond Is Forever," and the two months' salary guideline.